Can you handle your data? 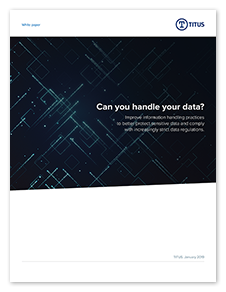 With today’s exponential data growth, organizations are struggling to protect their most sensitive information and also comply with increasingly strict information handling regulations. Threats to the security of all this data have grown in number and sophistication, meaning industry and geographic data regulations are more complicated and stricter than ever, with hefty fines if not followed. The key is to find ways to better identify and classify information to facilitate stronger data protection strategies. Manual processes for handling information, however, can be cumbersome when dealing with large volumes of data. In addition, many people don’t know how to treat the various types of data they encounter. Some people are unclear of classification expectations. And others are simply unfamiliar with the content. Many people will find workarounds that put sensitive data at risk when data handling processes seem too tedious. Digital tools for data identification and classification can help organizations meet all of these challenges efficiently and accurately. Read this paper to understand how organizations can improve information handling practices to better identify, classify and protect their sensitive data and comply with information rights regulations using these tools.